Though its a technological powerhouse, we all realized the BMW 7-series has not as of yet matched the sheer luxury of the Mercedes S-Class. The 7 is no doubt the full-sized Ultimate Driving Machine these days, but did the new refresh bring it closer to it’s direct competitors? Did it solve some of the introductory critisisms? Lets have a look. This LCI refresh is summed up in three key areas. The front end now wears a much larger and prominent grille. So large in fact that it folds over the top of a slightly reshaped hood. There are also slimmer, new adaptive LED headlights. Laser lights are an option, but I don’t believe they’ll be offered in the US market. (C’mon Feds. Wake up!). The rear end features reworked and more three-dimensional tail lamps. But the main difference is a thin LED light strip that runs the full width of the tail end joining both tail lights. This seems to be a trend previously seen on Audi models and lately on the new 992 Porshe. Interior-wise the instrumentation has been updated to the newest system shown on other BMW models that were recently introduced. These are the main updates joining other refreshes in the engine department and the paint and finish offerings. Personally, the grille will have to grow on me. Like most changes, I’m sure it will. I like the changes to the rear end and instrumentation. So this is the typical BMW mid-cycle refresh. Nothing earth shattering, but timely. We’ll see how the front end is received, but designers are frequently ahead of the curve. We just have to adjust and evolve. Updated BMW 6th Generation 7 Series Sedan. 6-cylinder, 8-cylinder, 12-cylinder and PHEV models available at launch. Market launch in April 2019. Pricing to be announced closer to on-sale date. Woodcliff Lake – Jan. 16, 2019… Today, BMW introduces the revised version of its most successful 7 Series to date. The 6th generation of the luxury sedan receives extensive updates in design, technology and powertrain to enhance the BMW 7 Series’ class-leading luxury model lineup. Turbocharged 6, 8 and 12 cylinder engines will be joined by a new 6-cylinder plug-in-hybrid variant when the new BMW 7 Series goes into production this March. Modern exterior design elements enhance the presence of the vehicle while the interior receives touches that upgrade the ambiance of luxury to new levels. The iDrive 7 system along with Mobileye interior camera and available Driving Assistant Professional bring BMW’s latest technology to the brand’s pinnacle luxury sedan. The design. Increased presence, refined elegance. Gracefully sporting proportions and alluring bodywork mark the exterior design of the new BMW 7 Series. 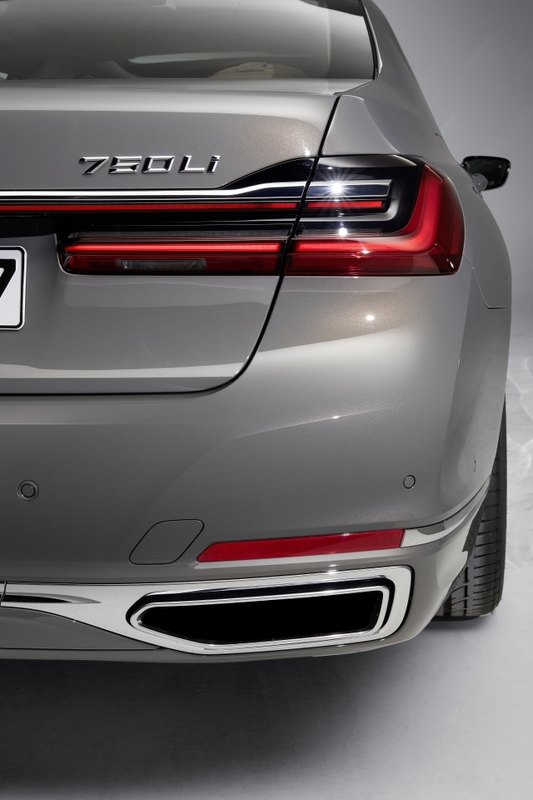 The latest edition of the 7 Series features design updates that touch almost every area of the body, including the front bumper, hood, headlights, front fenders, rear bumper trim and rear lights to accentuate the elegance of the BMW 7 Series. The 126.4 inch long wheelbase allows for a spacious 44.4 inches of rear leg room and an equally accommodating 41.1 inches of front legroom. Taller front end and significantly larger BMW kidney grille. The extensive design refresh at the front end plays the most prominent role in giving the new BMW 7 Series its more powerful visual presence. Catching the eye first is the significantly expanded surfacing at the front of the car, which is now two inches taller at its highest point. The dominant feature of the front-end design is the BMW kidney grille, now framed by a single-piece surround whose surface area has grown larger by 40%. The Active Kidney Grille features adjustable vanes which only open when the need for cooling air is increased. The bars of the U.S. vehicles’ kidney grilles come standard in aluminum satin. 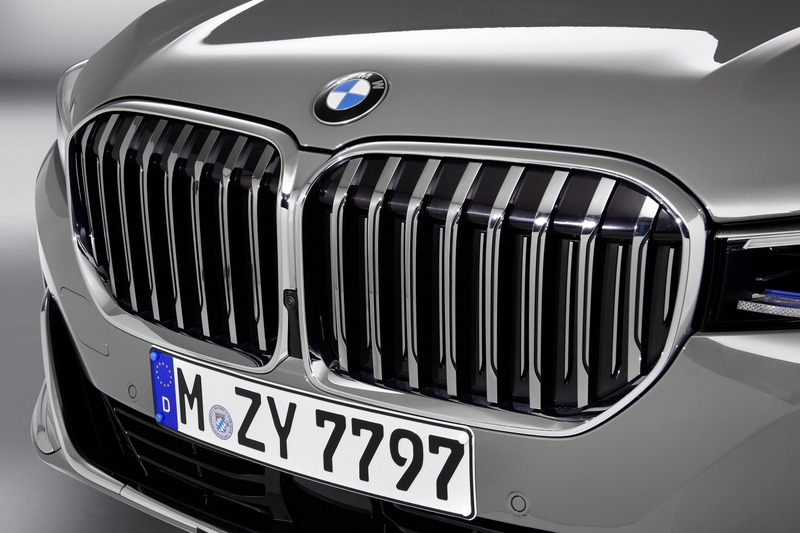 The front of the air vanes between the kidney grille bars are High-gloss Chrome or black if the M Sport package is specified. The new BMW M760Li xDrive Sedan features a kidney grille surround and kidney grille bars finished in Cerium Grey. Slim headlight units, BMW Laserlight available as an option. 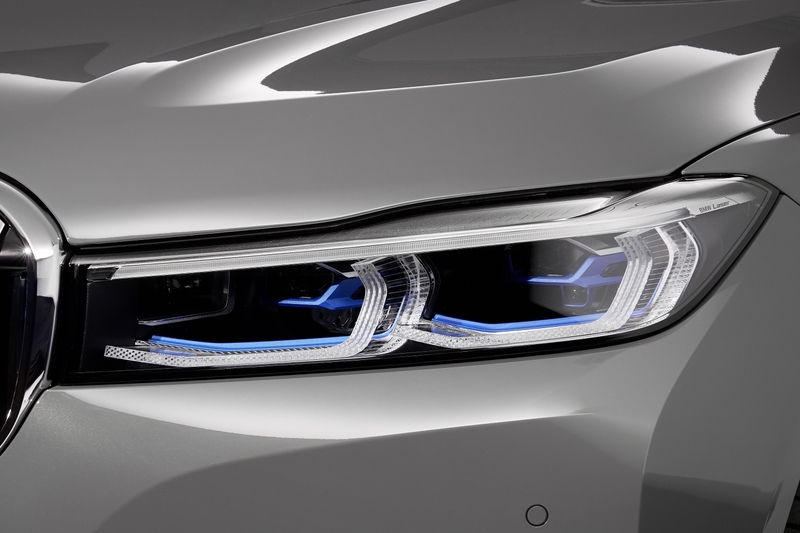 The new design of the very slender headlight units provides an attractive visual contrast with the significantly enlarged BMW kidney grille, adding a new character to BMW’s luxury-class models. Standard equipment for the new BMW 7 Series includes Adaptive Full LED Lights with BMW Laserlight available as an option. New hood contours, covered air intakes. Among the striking design changes made to the front of the car is the re-designed hood. It extends up to the top of the higher BMW kidney grille and features more sculpted contour lines. The lower front bumper air intakes are now overlaid with large air deflectors. These guide the oncoming air more efficiently to the brake air ducts and the Air Curtains, which help to minimize turbulence around the wheel openings. L-shaped trim strips border the Air Curtains. Newly designed fenders with upright Air Breathers. Muscular surfaces and precisely drawn character lines shape the profile view of the new BMW 7 Series. With a long wheelbase and short overhangs, a flowing roofline and the Hofmeister kink, the luxury sedan features recognizable hallmark BMW design cues. Exterior mirrors, attached to the window surround trim by a thin stalk, strike a modern appearance and further improve aerodynamics. The front fenders have been redesigned to gracefully tie in the new headlight and front bumper. The Air Breathers, visible behind the front wheel openings, now feature larger air outlets that extend much higher into the front fenders to help optimize the flow of air through the wheel openings to help reduce aerodynamic turbulence. New rear-end design with full-width light strip. The modern design cues flow into the rear of the new BMW 7 Series, providing a more horizontal effect to the rear trunk and bumper surfacing. The exhaust system’s tailpipes surrounds are now wider and are finished in either chrome on standard models or in Cerium Grey on M Sport models. The LED, three-dimensional rear lights of the new BMW 7 Series are 1.4 inches slimmer than on the outgoing car and cut a sophisticated figure. A sharply defined and very slim light strip (only 0.2 inches wide) extends across the full width of the tailgate and connects the rear lights with each other. This light strip creates a discreetly illuminated accent when the daytime driving lights are switched on and teams up with the L-shaped taillights to generate a characteristic and highly distinctive night design at the rear of the new BMW 7 Series when darkness falls. New paint finishes and light-alloy wheels. The selection of exterior paint finishes available for the new BMW 7 Series sees new metallic and Individual options replacing several outgoing choices. New Bernina Grey Amber Effect metallic, Royal Burgundy Red metallic and Donington Grey metallic (the latter available exclusively in conjunction with the M Sport package) replace Singapore Grey metallic, Jatoba Brown metallic and Magellen Grey metallic. Carbon Black metallic, Black Sapphire metallic, Cashmere Silver metallic, Glacier Silver metallic, Imperial Blue metallic, Dark Graphite metallic, Mineral White metallic and Arctic Grey metallic round out the metallic paint selections. Customers can also choose from four selected BMW Individual paint options, including the new shades Dravit Grey metallic, Tanzanite Blue II metallic and Aventurin Red metallic which replace outgoing Ruby Black metallic, Moonstone Metallic and Almandine Brown metallic. Azurite Black metallic joins the new Individual paints as a carry-over. Of course BMW Individual allows a customer to choose any color they wish, beyond the standard choices, for their new vehicle. The new BMW 740i, 740i xDrive and 745e xDrive Sedans come equipped with standard 18-inch light-alloy wheels and all-season run-flat tires, while the 750i xDrive features standard 19 inch wheels with all-season run-flat tires and the M760i xDrive sedan comes equipped with standard 20 inch wheels and performance run-flat tires. The 740i, 740i xDrive and 750i xDrive models additionally feature 19-inch wheel options with both all-season and performance run flat tires as well as 20-inch wheels with performance run flat tires. The new 745e xDrive sedan can be equipped with optional 19-inch wheels with either all-season or performance run-flat tires. Interior and equipment. Luxurious ambience with inspirational style and exclusive technology. Generous levels of space, carefully selected materials, harmoniously coordinated design details and exclusive workmanship combine to create a luxurious interior ambience in the new BMW 7 Series. Complementing the performance and refinement of the powertrain and chassis technology, these attributes ensure that the new BMW 7 Series offers both driver and passengers a luxurious on-board experience. The new updated interior includes a screen grouping formed by the instrument cluster and the Control Display, the extended functionality of its controls and further improvement of the infotainment systems with iDrive 7. Trim strips, leather-covered surfaces and light sources make a greater contribution to the exclusive feeling of the new BMW 7 Series cabin. Improved acoustic comfort makes for a more relaxing travel experience. Exclusive Nappa leather and BMW Individual Merino full leather trim with extended quilting and new interior trim strips. The new BMW 740i, 740i xDrive and 745e xDrive Sedans come standard with Dakota leather upholstery, available in five different colors. A choice of six color variants is offered for the optional Nappa leather upholstery with extended appointments (standard on the 750i xDrive and BMW M760i xDrive). A new Nappa leather with extended quilting is now available in Mocha and Cognac color choices as part of the optional Luxury Seating Package. The extensive, three-dimensional surface quilting is found on the front and rear seat cushions and backrests, the armrests integrated in the door trim and the center console and gives the interior a further touch of luxury. In models equipped with the Executive Lounge or Executive Lounge rear console options, the high-quality quilting is also to be found on the rear center armrest. The optional BMW Individual fine-grain Merino full leather trim – is available in six colors and features not only extended quilting but also contrast stitching and piping. The interior trim for the new BMW 7 Series allows the styling to be further individualized to the owner’s taste. New to the range are exclusive fine wood versions in American Oak Dark with metal inlay and Poplar Grain Metallic Grey high-gloss. Both the trim and the instrument panel’s chrome surrounds that border them are made individually for each car to ensure that their dimensions match down to the millimeter. The new design features also extend to the trunk of the new BMW 7 Series, where a stainless steel insert in the loading sill makes a stylish quality statement. This feature is standard equipment on all model variants with the exception of the plug-in hybrids. The M Sport package enhances the interior with a BMW Individual headliner in Anthracite, the M Sport leather steering wheel, M pedals and the M driver’s footrest, as well as illuminated M door sill plates and the Fineline Black fine wood interior trim strips with high-gloss metal effect. In the new BMW 7 Series, customers have the option of combining the M Sport package with a special version of Nappa leather upholstery with extended appointments. This option comprises black leather with a distinctive stitching pattern and M piping. The BMW M760i xDrive also complements its outstanding performance pedigree with a bespoke interior design. In addition to the M leather steering wheel, the BMW Individual headliner in Anthracite, the M pedals, the M driver’s footrest and the comfort seats upholstered in Nappa leather with extended appointments, this 12-cylinder model is equipped with Fineline Black fine wood interior trim strips with high-gloss metal effect, a digitally generated model badge in the instrument cluster, an insert in the center console in Piano Finish Black and illuminated door sill plates bearing the inscription “V12”. BMW EfficientLightweight and optimized aerodynamics. The body structure developed for the BMW 7 Series combines maximized occupant protection with optimized weight. This is made possible by a material mix of high-strength steels, aluminum and carbon fiber-reinforced plastic (CFRP) that is unrivalled by any of its competitors. The Carbon Core used for the passenger cell makes a major contribution not only to the high level of safety, but also to the agile handling characteristics of the BMW 7 Series. A significant role in the optimization of the vehicle’s aerodynamic characteristics is played by the active air flap control system along with Air Curtains and Air Breathers. Air drag is also reduced by the cladding covering almost the entire underbody. Enhanced acoustic comfort for an exclusive motoring experience. A series of refinements serve to enhance the acoustic comfort aboard the new BMW 7 Series. The level of tire noise reaching the rear compartment of the luxury sedans has been reduced by new shielding in the rear wheel arches. A further reduction in the interior noise level is attained through enhanced sound insulation elements in the B-pillar area, the seatbelt outlet covers and the rear seat backrest. Laminated glass with an increased thickness of 0.2 inches is now used not only for the windscreen, but also for the side windows and rear window too. This new construction for the side and rear windows is standard for the BMW 750i xDrive and BMW M760i xDrive models. The improved sound insulation is a significant factor in the superior level of comfort provided by the new BMW 7 Series. The electric power windows of the luxury sedans feature new drive motors and control units which ensure precise power management, smooth movement and a consistent sound when the windows are lowered and raised. Steering wheel, wireless charging tray for smartphones and Ambient Lighting. A chrome fascia element and a modified layout of the multifunction buttons define the redesigned standard leather steering wheel in the new BMW 7 Series. The button array for the driver assistance systems on the left-hand spoke of the steering wheel has been reorganized. The button for activating the standard heating system for the steering wheel is now located below the steering wheel airbag housing. The new BMW 7 Series models are equipped with standard wireless charging, now located in a more convenient position immediately in front of the cup holders. The standard ambient lighting comprises LED lighting in the vicinity of the instrument panel, the upper door trim, the map pockets on the front seat backs, and in the foot wells. Using the iDrive 7 system menu, it is possible to choose from six colors to adjust the indirect illumination to personal preference. Courtesy lights, illuminated bars on the door sill plates and the Welcome Light Carpet in the entrance/exit area are also included with ambient lighting. An even more sophisticated impression is created by the Ambient highlight feature in the B-pillars, which combines with the optional sun blinds for the rear side windows and rear window to create a particularly atmospheric lighting effect in the rear of the new BMW 7 Series. When deactivated, the vertically arranged light sources now blend into the ambience of the luxury sedans even more harmoniously as a result of their high-quality smoked-glass look. Passenger comfort in a class of its own: Rear Executive Lounge seating, Touch Command, Rear-seat entertainment. Available as an optional package in the 750i xDrive and M760i xDrive, the Rear Executive Lounge Seating appointments maximize the luxury and passenger comfort of the rear compartment. In addition to four-zone automatic climate control, the two, individual electrically adjustable comfort seats with massage function, the equipment package also includes active seat ventilation for all seats and an Executive Lounge Rear Console with Rear-seat entertainment Experience including a BMW Touch Command tablet. The Rear-seat entertainment system comprises two 10-inch full-HD displays complete with a Blu-ray player. The system allows users to access the entertainment, navigation and online functions of the vehicle from the rear seats. The viewing angle of the screens, which now have touchscreen functionality, can be adjusted in accordance with the rear seat passengers’ current seat position. Further improved hardware is the defining characteristic of the latest version of the BMW Touch Command unit. This removable tablet with a screen diagonal of seven inches can be used from any seat and even outside the vehicle. It lets the occupants operate comfort functions such as seat adjustment, interior lighting and climate control, as well as the infotainment, navigation and communication systems. It can also be used to play external audio and video files. The graphics and menu system of the BMW Touch Command tablet and the Rear-seat entertainment Experience displays are now aligned with the software features and functionality of BMW iDrive 7, which is also used for the all-digital displays of the instrument cluster and Control Display in the new BMW 7 Series to create an environment with a contemporary look and feel focused on the individual needs of the user. Engines, transmission and BMW xDrive. Cutting-edge powertrain technology for a luxurious driving experience. The new BMW 7 Series takes the driving pleasure experience in a luxury sedan as seriously as it does the comfort of the passengers. The new BMW 7 Series is available with six, eight and twelve cylinder engines, as well as a plug-in hybrid drive system with a brand new design offering increased electric range, enhanced performance and lower consumption. The standard eight-speed Sport Steptronic transmission has undergone improvement, as has the BMW xDrive intelligent all-wheel-drive system. All the engines fitted in the new BMW 7 Series share a number of common features: aluminum construction, optimized thermodynamics and the very latest BMW TwinPower Turbo technology. The technology package for the engines features twin-scroll turbochargers, High Precision Injection, VALVETRONIC fully variable valve timing and Double-VANOS variable camshaft control. Prestige plus performance: V12 engine in the BMW M760i xDrive. Spearheading the line-up of engines for the new BMW 7 Series is the twelve-cylinder motor that sets the benchmark for power delivery in the luxury segment. Traditionally the most prestigious engine variant, the V12 serves up a blend of unrivalled smoothness and tremendous performance. The engine powering the new BMW M760i xDrive has a displacement of 6.6 liters from which it extracts 600 hp between 5,500 and 6,500 rpm. The peak torque of 627 lb-ft is on tap over a wide rev range from 1,550 to 5,000 rpm. The high-performance engine propels the remarkably sporty luxury sedan from 0 to 60 mph in just 3.6 seconds. The top speed of the new BMW M760i xDrive is electronically limited to 155 mph. Extreme rigidity, weight optimization and effective reduction of vibrations are the defining qualities of the V12’s basic design. The all-aluminum engine’s two banks of cylinders are positioned at an angle of 60 degrees. On the outside of each bank is a single, mono-scroll turbocharger with indirect charge air cooling and a separate cooling circuit. In order to reduce back pressure, the exhaust gases flow unimpeded through the twin-pipe exhaust system’s rear silencer whenever the exhaust flap is open. The rear silencer combines with exhaust flap control to give the engine a broad acoustic spectrum, ranging from creamy smooth to dramatically sporty. The buttons of the Driving Experience Control switch can now be used to select an additional SPORT+ mode in the new BMW M760i xDrive that activates a track-geared vehicle set-up including linear throttle response, direct, sporty, undamped engine response and a particularly vocal soundtrack. New V8 engine built for effortless sportiness. One of the biggest changes in the engine range for the new BMW 7 Series is the eight-cylinder unit fitted in the BMW 750i xDrive Sedan. After undergoing an extensive overhaul covering everything from the crankcase through to the engine management, the 4.4-litre V8 generates a maximum output of 523 hp – 80 hp more than the engine it replaces – between 5,500 and 6,000 rpm. The 553 lb-ft of peak torque represents an increase of 74 lb-ft and is available from 1,800 – 4,600 rpm. The engine’s standout features include the pair of twin-scroll turbochargers nestled in the 90-degree angle between the two banks of cylinders. Straight-six gasoline engine with a thirst for revs. The power unit fitted in the new BMW 740i and 740i xDrive boasts the free-revving ability inherent in all six-cylinder inline engines from BMW, plus wonderfully eager response. The 3.0-liter unit employs a twin-scroll turbocharger and direct petrol injection technology whose maximum pressure of 5,076 psi ensures the fuel is delivered in extremely precise doses. The straight-six generates its maximum output of 335 hp between 5,500 and 6,500 rpm, while the peak torque 330 lb-ft is waiting to be unleashed from 1,500 – 5,200 rpm. The new BMW 740i completes the 0 to 60 mph sprint in just 5.3 seconds while the BMW 740i Xdrive’s extra traction allows it to accelerate to 60 mph in 4.8 seconds. Plug-in hybrid drive system: now with six-cylinder in-line engine. The plug-in hybrid variant in the new BMW 7 Series range takes all of the luxury sedan’s sporty prowess, passenger comfort and soothing ambience and combines them with exceptionally high efficiency and the ability to offer a virtually silent, all-electric driving experience with zero emissions. The integration of a six-cylinder in-line engine into the plug-in hybrid system, a more advanced high-voltage battery, more power and torque, plus improved figures for electric range, chart the progress that has been made compared with the outgoing model. The plug-in hybrid model that will be available at the launch of the new BMW 7 Series in spring 2019 capture all of the luxury sedan’s essence even more effectively than before. Its newly developed drive technology consists of a specially adapted six-cylinder in-line engine from the current BMW EfficientDynamics family of power units – whose maximum output of 280 hp is delivered with characteristic smoothness and free-revving eagerness – an electric motor with a rated output of 113 hp and a rated torque of 195 lb-ft, and a new lithium-ion battery with the latest battery cell technology and increased capacity. Enhancements have also been made to the power electronics, whose intelligent energy management ensures precisely orchestrated interaction between the two drive units and, if the proactive driving function is activated, efficiently coordinates the electric driving phases to coincide with sections of the journey that should be covered without any emissions. At the same time, the added performance from the electrical boost, which translates into even more response, is greater than before, as is the gain in efficiency produced by the assistance from the electric motor. With the Driving Experience Control switch set to SPORT mode, the drive duo can unleash a combined output of 389 hp, while the maximum combined torque for the plug-in hybrid variants in the new BMW 7 Series is up to 442 lb-ft. The new plug-in hybrid drive technology enables the BMW 745e xDrive to record a 0-60 acceleration time of 4.9 seconds. The energy required for this is stored in a latest-generation lithium-ion battery located underneath the rear seats with an increased gross capacity of 12.0 kWh (10.4 kWh net). The all-electric driving range will be available closer to on-sale date. New eight-speed Sport Steptronic transmission: sportier gear shifts plus more comfort and efficiency. A latest-generation eight-speed Sport Steptronic transmission assumes the task of relaying the engine’s power to either the rear wheels (740i) or to the BMW xDrive all-wheel-drive system found in all of the other new 7 Series models. When mated to the six and eight-cylinder engines, the transmission’s new control electronics and wider ratio spread help to further increase the drive system’s overall efficiency. Improvements have been made across the board in terms of driving, shifting and acoustic comfort, thanks to new torsion dampers that limit rotational forces in the powertrain while improved hydraulic control enables sportier gear shifts. The BMW 745e xDrive is equipped with a hybrid-specific variant of the eight-speed Sport Steptronic transmission incorporating both the electric motor and an improved separating clutch that acts as the link to the engine. It’s extremely compact design means it is only around 0.6 inches longer than the transmissions in the non-hybrid models. The Launch Control function of the standard Sport Steptronic transmission aids by optimizing traction during acceleration when this feature is used. Intelligent networking enables the eight-speed Sport Steptronic transmission’s controller to work with the navigation information when selecting the best shift strategy. As a result, unnecessary gear shifts are reduced when driving through a succession of bends and optimum use can be made of the engine braking effect when approaching a junction. The drive system’s networking with both the navigation system and the cameras and radar sensors likewise serves to maximize the efficiency-enhancing effect of the Auto Start Stop and coasting functions. In this way, inefficient engine shutdown when stopping only briefly is prevented, while the coasting function – which is now also available with the Driving Experience Control switch set to COMFORT mode on all models apart from the BMW M760i xDrive – is only activated if the route topography and traffic situation mean it won’t compromise either comfort or performance. Fully variable, precise and efficient: BMW xDrive intelligent all-wheel drive. The luxury sedan’s traction, agility and handling stability receives a boost with the addition of BMW xDrive. The intelligent all-wheel-drive system is networked with the Dynamic Stability Control (DSC) system and employs an electronically controlled multi-plate clutch to swiftly and precisely distribute the drive torque between the front and rear wheels in a fully variable ratio as the situation demands. This means the engine’s power can always be directed to the wheels with maximum traction for loss-free transfer to the road, even in extremely dynamic driving situations or in adverse road and weather conditions. To increase the system’s efficiency, all of the drive torque is sent to the rear wheels in situations in which all-wheel drive is not needed. All-wheel drive comes standard all new BMW 7 series models except for the rear-wheel drive 740i. Chassis technology and driving experience. Unbeatable comfort and signature BMW dynamics on demand. An exceptional balance between supreme driving comfort and the exhilarating flair for which BMW is renowned are the defining features of the driving experience on board the new BMW 7 Series. The construction of the chassis, the suspension and damping systems, the steering and the braking system are designed to facilitate both relaxed cruising undisturbed by inconsistencies in the road surface and a sporty, active driving style. The driver can use the Driving Experience Control buttons to select a set-up option to suit the situation – and configure that set-up individually in part. The set-up options cover the car’s drive functions and the manner in which its chassis systems go about their work. This allows the potential of the chassis technology to be fully experienced. In ADAPTIVE mode, the overall set-up adapts automatically to the driving style and situation, responding to movements of the accelerator pedal and steering wheel, the position of the gear selector lever and data from the navigation system to instantly select the right set-up as the car moves from city driving to higher-speed roads, for example, or approaches a corner. The design principle behind the double-wishbone front axle and five-link rear axle of the new 7 Series underpins its near-perfect balance between dynamic performance and comfort. The separation of wheel location and damping ensures the steering remains unaffected by disruptive forces from road surface imperfections. And high cornering speeds can be achieved without impacting negatively on ride comfort. The rear suspension uses its dual elastic bearings and tuned elastokinematics to ensure precise wheel location and excellent directional stability. The large rear axle sub-frame mounting provides an effective separation of the powertrain and suspension from the passenger cell, which benefits acoustic comfort. All variants of the new BMW 7 Series feature standard adaptive suspension including electronically controlled dampers and two-axle air suspension with automatic self-levelling. Plus, the Driving Experience Control switch can be used to activate a range of damper settings to shift the emphasis of the driving experience further towards either comfort or sportiness. The suspension’s air supply is controlled individually for each wheel, making it possible to balance out an unevenly loaded car. Plus, the height of the body can be adjusted manually. For example, it can be raised by 0.8 inches at the touch of a button on bumpy road surfaces or steeply-angled driveways. The spring/damper tuning in the new BMW 7 Series provides the basis for extremely dynamic handling properties combined with excellent ride comfort. Even greater control of body roll through keenly taken corners sharpens the sporting character of the luxury sedan. The set-up of the Electric Power Steering system has also been refined to improve both agility and handling precision. Integral Active Steering increases comfort, agility and poise. The optional Integral Active Steering demonstrates its strengths in a myriad of different driving situations. The system brings together the electromechanical steering of the front wheels – complete with Servotronic speed-sensitive steering assistance and variable steering ratio – with rear axle steering. The variable steering ratio allows BMW 7 Series drivers to execute low-speed maneuvers with only small steering inputs and without having to change their grip on the steering wheel. At higher speeds, the car’s responses to movements of the steering wheel are less pronounced, improving both directional stability when driving in a straight line and precision on the way into corners. At low speeds, the rear wheels turn in the opposite direction to the front wheels, increasing the car’s maneuverability and significantly reducing its turning circle. By contrast, at higher speeds, the rear wheels follow the same direction as the front wheels, allowing the car to follow the course set by the driver even more quickly and accurately. Both in corners and when overtaking or changing lanes, Integral Active Steering imbues the luxury sedan with impressive poise and comfort. Active Comfort Drive with Road Preview and active roll stabilization. The optional Active Comfort Drive with Road Preview chassis system further hones the ride comfort and dynamic ability of the new BMW 7 Series. Available for all model variants aside from the BMW 745e xDrive, this active chassis control technology reduces rolling movements at the front and rear axle. The Active Comfort Drive with Road Preview system teams up with the standard two-axle air suspension and electronically controlled dampers to provide exceptional suspension and damping comfort and keep vibrations to a minimum. Active roll stabilization uses electric swivel motors to ensure fast and precise compensation of the lateral forces generated in dynamically taken corners. This enhances the car’s agility and directional stability when entering or exiting corners. The system noticeably increases comfort when driving straight ahead by counteracting disruptive forces resulting from road surface imperfections on any one side. Active Comfort Drive with Road Preview also includes an anticipatory chassis control function. The advance information for controlling the combination of chassis systems is learned from driving style analysis readings, data from the navigation system and a stereo camera, and significantly increases ride comfort and active safety. Driver assistance systems. Heading down the road to automated assisted driving in comfort and safety. The new BMW 7 Series underlines its status as one of the luxury segment’s most innovative and models with a comprehensive range of standard and optional driver assistance systems. Numerous new functions have now been added to the systems, through the introduction of BMW’s latest generation of advanced driver assists systems, which come to the driver’s aid in all sorts of different situations and specifically enhance various aspects of comfort and safety in the process. They ease the driver’s workload in monotonous driving conditions, such as traffic jams and heavy flowing traffic, and make it easier to stay in complete control in awkward traffic situations. Camera images and the data gathered by radar and ultrasonic sensors are used to monitor the vehicle’s surrounding area and either alert the driver to hazards or minimize the risk of an accident by means of corrective braking and steering. The assistance systems fitted in the new BMW 7 Series with their impressive wealth of features demonstrate how much progress has been made along the road to automated driving. The Active Driving Assistant package is standard equipment for the new BMW 7 Series. Based on camera and radar technology, it includes the Collision and Pedestrian Warning with City Braking function, the latest version of which also alerts the driver when a cyclist is detected. The Active Driving Assistant additionally includes the Lane Departure Warning Blind Spot Detection systems, which are operational from 44 – 130 mph and from 12 mph up to top speed respectively and help the driver guide the vehicle back onto the correct path with an active turn of the steering. The Active Driving Assistant also features the Speed Limit Info system, Rear Collision Preparation and Cross Traffic Alert, which mitigate rear end collisions. Driving Assistance Professional: complete assistance for comfortable and safe driving. The optional Driving Assistance Professional package adds the Driving Assistance Professional suite of features. It offers extensive assistance to make driving as safe and as comfortable as possible. This comprehensive package adds Extended Traffic Jam Assistant for limited access highways, Active Cruise Control with Stop & Go, Active Lane Keeping Assistant with side collision avoidance, Steering & Traffic Jam Assistant, Automatic Lane Change and Evasion Assistant & Cross Traffic alert. Extended Traffic Jam Assist for limited access highways greatly eases the driver’s burden during what may be the most tedious part of driving, stop and go highway traffic. Operating at speeds up to 37 mph on divided highways, this assist system uses the interior driver-facing camera to allow the driver extended hands off driving as long as they are attentive to the road ahead. It also handles acceleration and braking and is capable of adapting the road speed to the planned route with the help of navigation data. As a result, the vehicle is automatically decelerated to an appropriate speed in preparation for bends, junctions or roundabouts ahead. The camera-based traffic sign recognition system also makes use of the navigation data to glean information on upcoming speed restrictions so that they can be taken into consideration in advance. Evasion Assistant & Cross-traffic alert can help avoid collisions with vehicles or pedestrians suddenly appearing in the driver’s path. As soon as an evasive maneuver corresponding to such a scenario is detected, the system supports the driver when they steer the vehicle into a clear adjacent lane. Improved driver focus and visibility in the dark: BMW Head-Up Display and BMW Night Vision. By projecting information graphics onto the windscreen, the optional BMW Head-Up Display provides a particularly effective means of focusing on the task of driving. The system mirrors the information directly into the driver’s field of vision where it can be assimilated without any need for them to divert their eyes from the road. This includes details of vehicle speed, speed limits and overtaking restrictions, Check Control messages, status indicators and warnings from other assistance systems, detailed turn instructions, plus telephone and entertainment lists. The optional BMW Night Vision system includes pedestrian and animal detection as well as a marker light. It relays a real-time video image to the Control Display showing persons, larger animals and other heat-emitting objects. Any objects detected are additionally illuminated using the headlights’ marker light function. A helping hand with parking and maneuvering: standard Parking Assistant Plus and rear view camera. Drivers of the new BMW 7 Series also receive effective assistance when parking and maneuvering. The standard Active Park Distance Control (PDC) with sensors at both the front and rear has a range of functions, including not just visual and acoustic warnings but also automatic application of the brakes to prevent collisions with obstacles in the area surrounding the vehicle. A rear view camera comes standard, as does the Automatic Parking Assistant for automatically selecting and maneuvering into spaces that can now be either parallel or perpendicular to the road. Suitable parking spots are identified with the help of ultrasonic sensors as the vehicle drives past. During the parking maneuver, the system takes care of controlling the accelerator, brakes and steering as well as changing gear. In addition to this, the system can be used for automatically maneuvering out of parallel parking spaces too. Unique in segment: Back-Up Assistant. Another of the Parking Assistant Plus’s features is the ingenious Back-Up Assistant, which helps the driver to exit parking spots or maneuver when space is limited. This system is the only one of its kind in this segment and offers the highly convenient facility of automated reversing, especially in confined spaces or situations where the driver does not have a clear view, such as multi-story car parks, entrances to courtyards or narrow driveways. This is done by storing the steering movements made during the vehicle’s last forward maneuver when travelling at speeds up to 22 mph. The system is then able to steer the vehicle for distances of up to 50 yards along exactly the same line it took when moving forward. All the driver has to do is operate the accelerator and brake pedals and monitor the vehicle’s surroundings. The Panorama View and 3D Top View features are used to depict a 360° image of the vehicle and its surroundings from different perspectives in the Control Display. The Remote 3D View function additionally gives drivers the ability to call up a three-dimensional live image of their vehicle and its immediate vicinity on their smartphone. BMW Live Cockpit featuring BMW iDrive 7.0 Operating System, BMW Connected and ConnectedDrive. Digital, intelligent and totally connected. Standard specification for the new BMW 7 Series includes the BMW Intelligent Personal Assistant, an intelligent, digital helper which responds to the prompt “Hey BMW” and is an intrinsic element of the iDrive 7 operating system. The BMW Group is set to revolutionize driving ease with the BMW Intelligent Personal Assistant, as it marks the start of a new era in which drivers will increasingly be able to operate their car, access its functions and obtain information simply by speaking. BMWs acquire a digital personality. The BMW Intelligent Personal Assistant learns routines and habits, and is subsequently able to apply them in the appropriate context. It helps the driver, learns their preferences and is familiar with the settings they like to have for the seat heating, for example, or the places they navigate to frequently (“Take me home”). One unique feature compared with other digital assistants of this type is the option of naming it (such as “Charlie”) for even greater individuality and personality. Not only does the assistant await the driver’s every command, it’s always there to assist and even provide casual conversation. It is familiar with the vehicle’s functions and is able to operate them as required. Saying “Hey BMW, I’m cold” will prompt the BMW Intelligent Personal Assistant to adjust the temperature inside the car accordingly. Ongoing improvement of the technology will enable it to learn more and more preferences and favorite settings in future. The assistant gets better and better with every command given, every question asked and every setting made. Always on board: the digital BMW expert. The arrival of the BMW Intelligent Personal Assistant ensures there is always a genuine BMW professional on board. It is able to explain all sorts of different functions (“How does Park Distance Control work?”), provide current status information (“Is the oil level okay?”) and help answer questions (“What warning messages do I have?”). It knows the driver’s favorite settings, and can even activate a combination of them to enhance wellbeing. For instance, “Hey BMW, I’m tired” triggers a vitality program that adjusts the lighting mood, music and temperature, among other things, in order to make the driver feel more alert. The BMW Intelligent Personal Assistant is, in short, the ideal assistant and comes in particularly useful during everyday driving (“Hey BMW, how far can I drive before I need to refuel?”). Navigation can now be made simpler than ever, as the assistant will suggest convenient parking, both on and off street, at the journey’s destination, provide information on any traffic jams along the route and even search for a café in the vicinity. It learns destinations the customer drives to frequently. Connected Navigation with new digital services. “Connected Navigation” encompasses a number of digital services that are designed to turn seamless and contextual route planning both inside and outside the BMW into an even more sophisticated experience. Drivers of the new BMW 7 Series can share destinations from some of their favorite apps straight to their car’s navigation system. The key destinations will be stored in BMW Connected and synchronized with the car, so that the most important addresses can be accessed from any device at any time. One particularly helpful new feature is the Automatic Parking, which proposes various parking options both on and off street before the destination is reached. This service provides information on the nearest parking lots and garages as well as proposing routes offering a particularly good chance of finding a parking spot close to the destination. To help create the new Automatic Parking Assistant, the existing On-Street Parking Information data and Parkmobile services have been intelligently incorporated into its scope of functions. Exactly the right information at just the right time: the BMW iDrive 7.0 Operating System. The newly designed screen grouping comprising the instrument cluster and Control Display, together with the inclusion of new functions, enables intuitive operation to be taken to the next level in the new BMW 7 Series, while helping drivers to concentrate even more effectively on the road ahead. The standard BMW Live Cockpit Professional comprises a fully digital, high-resolution instrument cluster behind the steering wheel with a screen diagonal of 12.3 inches and a Control Display measuring 10.25 inches across. This package of equipment also features an adaptive navigation system and a hard-drive-based multimedia system with 20 GB of storage. The BMW Live Cockpit Professional brings the 7th generation of BMW iDrive to the new BMW 7 Series. The operating system’s most recent incarnation boasts all-digital displays and is geared more closely to the driver’s personal needs – with the aim of maximizing their attention levels. The system’s clear presentation and structuring is designed to provide drivers with the right information at the right time, aided further by the customizable and personalized content. The redesigned information display in the center of the instrument cluster now leaves enough room for an excerpt from the navigation map, for instance. In the main menu on the Control Display, the driver is able to create and individually configure up to ten pages, each showing two to four widgets (tiles) with live content such as navigation, vehicle information and entertainment. Both the content and the graphics are personalized to an even greater degree, as illustrated by the vehicle mock-up that matches the actual model and body color. The intuitive multimodal interaction between driver and vehicle benefits from further improvement. The Control Display graphics adapt depending on the operating method and the voice control system based on natural language understanding is better than ever. Depending on the situation, the driver can choose from the familiar iDrive Controller, the steering wheel controls, touch screen control, voice control or gesture control, depending on the preferences of the driver. The new BMW 7 Series comes standard with an extensive list of equipment, from comfort to safety. Standard features include Dynamic Damper Control and two-axle air suspension, soft-close automatic doors and comfort access keyless entry, panoramic sunroof, Harman –Kardon surround sound system, Wireless Charging, Gesture Control, Wi-Fi Hotspot, Apple CarPlay Compatibility with 1-year trial, Multi-contour seats, split-fold-down rear seats and Ambient lighting. Standard assist systems include the Active Driving Assistant which includes Active Blindspot Detection, Frontal Collision Warning with City Collision Mitigation, Lane Departure Warning, Speed Limit Information, and Rear-Cross-traffic Alert and Collision preparation. The standard Parking Assistant Plus, includes Active Park Distance Control, Surround View 3D Camera system and the Back-up Assistant. Autobahn Package (for 740i, 740i xDrive and 750i xDrive) – includes Integral Active steering and Active Comfort Drive with Road Preview. Cold Weather Package (for 740i, 740i xDrive, 750i xDrive and 745e xDrive) – includes Remote Engine Start, Front and Rear Heated Seats and Heated Front Seat Armrests and Steering Wheel. Driving Assistance Professional Package (for all models) – includes Extended Traffic Jam Assistant for limited access highways, Active Cruise Control with Stop & Go, Active Lane Keeping Assistant with side collision avoidance, Steering and Traffic Jam Assistant, Automatic Lane Change, Evasion Assistant & Cross-traffic front alert. Interior Design Package (for 740i, 740i xDrive, 750i xDrive and 745e xDrive) – includes wood grab handles, Rear Seat Belt Cover in wood trim, Rear Center armrest with wood trim, Luxury Rear Floor Mats and Alcantara Headliner in Coordinated Upholstery Color. Luxury Rear Seating Package (for all models) – includes Rear ventilated seats, rear comfort seats, Heated steering Wheel with Front & Rear Heated seats and armrests, Rear Massaging seats and 7 inch Touch Command Tablet. M Sport Package (for 740i, 740i xDrive, 750i xDrive and 745e xDrive) – includes M Sport exhaust(750i xDrive only), a choice of 19 inch or 20 inch wheels and tires, M Sport steering wheel, specific aerodynamics, Shadowline exterior trim, Anthracite headliner, M door sills and foot rest and a choice of interior trim. Executive Package (for 740i, 740i xDrive, 750i xDrive and 745e xDrive) – includes Panoramic Sky Lounge LED Roof, Front ventilated seats, Instrument panel with Nappa leather finish and ceramic controls. Additionally on the 750i xDrive, this package includes Power rear sunshade & rear side window shades. Premium Package (for 740i, 740i xDrive and 745e xDrive) – includes Power rear Sunshade and rear side window shades, Heads-Up display along with a choice of Nappa Leather interiors. Rear Executive Lounge Seating Package (for 750i xDrive and M760i xDrive) – includes Electric Reclining individual rear Seats and Footrest (on passenger side), Executive Lounge Rear Center Console, rear Entertainment Professional. Individually available notable options include: Remote Engine Start, 19 inch and 20 inch wheels and tires, m Sport Brakes, Integral Active Steering, Space-saver spare, Ambient Air Package, Front massaging seats, BMW Laserlight, Remote Control parking, Bowers 7 Wilkins Diamond Surround Sound System, Rear-seat entertainment Professional and Night Vision with Pedestrian Detection. BMW of North America, LLC has been present in the United States since 1975. Rolls-Royce Motor Cars NA, LLC began distributing vehicles in 2003. The BMW Group in the United States has grown to include marketing, sales, and financial service organizations for the BMW brand of motor vehicles, including motorcycles, the MINI brand, and Rolls-Royce Motor Cars; Designworks, a strategic design consultancy based in California; technology offices in Silicon Valley and Chicago, and various other operations throughout the country. BMW Manufacturing Co., LLC in South Carolina is the BMW Group global center of competence for BMW X models and manufactures the X3, X4, X5, X6 and X7 Sports Activity Vehicles. The BMW Group sales organization is represented in the U.S. through networks of 346 BMW passenger car and BMW Sports Activity Vehicle centers, 148 BMW motorcycle retailers, 126 MINI passenger car dealers, and 37 Rolls-Royce Motor Car dealers. BMW (US) Holding Corp., the BMW Group’s sales headquarters for North America, is located in Woodcliff Lake, New Jersey.